I.B.S. 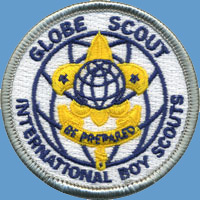 introduced the Globe Scout rank after approval of the new rank system by the World Scout Bureau in 1956. Prior to 1956 the highest I.B.S. Scout rank was First Class and Scouts were then recognized for further work on Merit Badges. Scouts listed prior to 1956 applied for recognition after the introduction of the new I.B.S. rank system and, after qualification, were recognized as having completed the equivilent of the Globe Scout requirements prior to the formal introduction of the award but while still active as a Scout in the I.B.S.